Fifty years ago, there were no peacock bass in Lake Gatun, which forms a major part of the Panama Canal watershed. Today, this Amazonian cichlid is the most common fish in the lake. The arrival of peacock bass not only altered the balance of species in Lake Gatun, it drove some native species to local extinction. A new study led by University of Maryland biologists suggests that adaptable vision may have provided an edge to the peacock bass. The research—conducted by UMD biological sciences graduate student Daniel Escobar-Camacho, UMD Biology Professor Karen Carleton and an international team of colleagues—was published in the March 18, 2019 issue of the Journal of Experimental Biology. The new study revealed that the sensitivity of photoreceptors in the peacock bass’ eyes matched the wavelength of available light in the water where they were collected. The work also showed that there was a lot of variation in water turbidity throughout the lake. Escobar-Camacho and his colleagues believe that variable light conditions, caused by murkiness from human activity in the canal, combined with highly adaptable vision may have aided the peacock bass invasion of the lake. Adaptable vision would have enabled the fish to take advantage of multiple habitats and to be a more effective hunter in poor visibility. 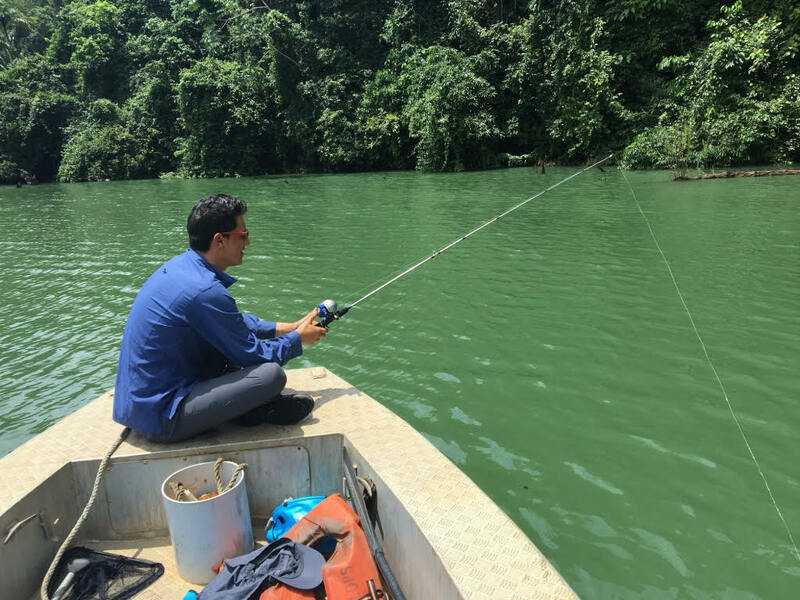 To conduct the study, the researchers collected fish from both clear and turbid sites around a small island in Lake Gatun. They measured the spectral sensitivity of the fish’s photoreceptors from different light conditions and also sequenced RNA from the fish’s eyes. Some fish were analyzed immediately after collection while others adjusted to light conditions in clear outdoor glass tanks at Smithsonian Tropical Research Institute’s Naos Research Laboratories in Panama for six months. The sensitivity of photoreceptor cells in fish retina is determined by the level of vitamin A and the genetic expression of proteins called opsins. Combined, vitamin A and opsin expression make a visual pigment that converts light into electrochemical signals, which tell the brain how to interpret colors. Vitamin A is the light-sensitive molecule that affects which wavelengths the cells absorb. Previous work showed that fish can change opsin expression to adjust light sensitivity, but this new study found that opsin expression was not a primary factor in this case. Rather, a shift in the proportions of vitamin A1 and A2 in the fish’s retinas gave them their visual adaptability. Most vertebrates rely on vitamin A1, but fishes are among the few animals that can use either vitamin A1 or A2. The researchers found that peacock bass collected in murky water had higher proportions of vitamin A2 in their retinas than those collected in clearer water. Vitamin A2 shifts light sensitivity to favor longer wavelengths. It turns out that the suspended particles that cause murkiness in the Panama Canal absorb much of the short-wavelength light, so light available for seeing consists mostly of longer wavelengths. In addition, the fish collected in murky waters and then kept in clearwater tanks for six months demonstrated a shift to higher proportions of vitamin A1. In other words, the fish lost their sensitivity to longer wavelengths that they possessed when they were in turbid waters. Although genetic analysis proved that the fish did not modify opsin expression, the fish did use gene expression to enhance their physiology for different water conditions. For example, fish collected from murkier water showed expression in genes associated with inflammation, stress and other features that may have been a response to poor water quality. Invasive species can only succeed if they can adapt rapidly to unfamiliar habitats. According to Escobar-Camacho, this work proves that shifts in gene expression can provide physiological advantages in different environments, and it demonstrates how multiple mechanisms of adaptation can aid a potentially invasive species. Watch this video to learn more about Carleton and Escobar-Camacho’s work with ciclid vision. The Institute for Bioscience & Biotechnology Research contributed to the RNA sequencing for this study. The research paper, “Variable vision in variable environments: the visual system of an invasive cichlid (Cichla monoculus, Agassiz, 1831) in Lake Gatun, Panama,” Daniel Escobar-Camacho, Michele E.R. Pierotti, Victoria Ferenc, Diana M.T Sharpe, Erica Ramos, Cesar Martins and Karen L. Carleton, was published in the Journal of Experimental Biology on February 20, 2019. The work was supported by the National Institutes of Health (Award No. R01EY024693); the partnership program between the University of Maryland and University of Tübingen; and a graduate fellowship of the Secretariat of Higher Education, Science, Technology and Innovation of Ecuador (Award No. 2014-AR2Q4465). The content of this article does not necessarily reflect the views of these organizations.